CMS Beta club is hosting a school-wide canned dog food drive for the Crossett pound! CMS Band with their medals from Solo and Ensemble! 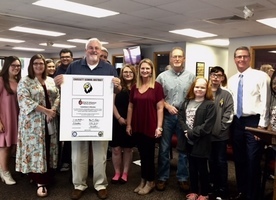 CLC Pledges to Support Education! 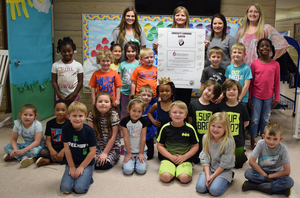 Crossett Learning Center students and staff show their support for education in Arkansas by signing the Commitment to Education certificate! 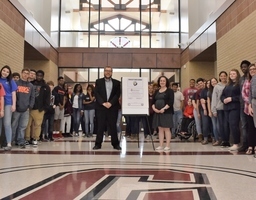 CHS celebrates those who have committed to the teaching profession by signing the Commitment to Education certificate, showing their personal pledge to the staff and students of Crossett High School. Dear Parents and Seniors, Mrs. Harrod, the College and Career Coach, is hosting a Lunch and Balloon Launch for the graduating seniors and their parents. This will be held on April 30th and will start at 1:00 p.m. at the Outdoor Amphitheater at CHS. The seniors will be grouped by what college, branch of the military, or work field they will be attending after graduation. We would love to have all parents attend if possible to show your support for your graduating senior,and each senior is allowed 2 quests. The Special Olympics will be held at Yarbrough Field on May 10th. We are in need of volunteers! You must be 14 or older. Please click the following link for the application: http://www.crossettschools.org/o/district/browse/53532 Applications need to be returned to the Crossett Schools Administration Office at 219 Main St. or emailed to Melissa Maggio at melissa.maggio@crossettschools.org You will be contacted if you are selected to volunteer!